A 14-ton bronze national monument atop the steps of the Hill of Glory pays tribute to the Army of the Andres battle for liberation, which freed Argentina, Chile and Peru from Spanish rule in the early 19th century. Travelers can wander the crooked path through San Martin Park, past a Greek theater and soccer stadium, to this historic monument, which was designed by a Uruguayan artist and is a recognized part of the urban skyline. Stones for this iconic memorial were trekked in from the Uspallata area of the Mendoza Mountains. 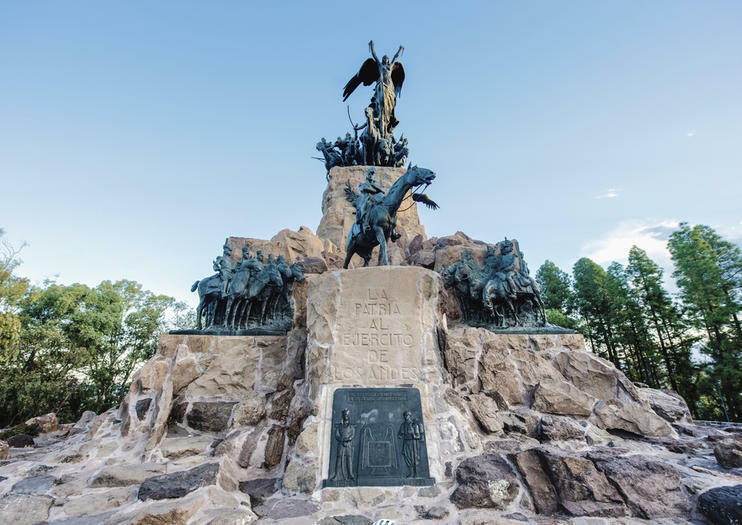 Life-like images depicting struggles, victories and historic moments are etched into the sides of the Hill of Glory, but it’s the massive statues of brave soldiers perched atop the towering rocks that make this piece of public art so noteworthy. Travelers must enter through San Martin Park—one of the city’s most famous green areas—in order to access the Hill of Glory. When visiting Argentina, you want to see it all, but then you realize just how big and spread out this South American destination truly is. Not to worry, this 14-day adventure takes care of all the logistics so you can simply enjoy the ride while hitting the best spots. Tango in Buenos Aries, marvel at Iguazu, the world's largest waterfalls, trek along a glacier in Patagonia, then sip local Malbecs in Mendoza.